As the fall leaves drop and the cooler weather arrives, we can sometimes be left yearning for a splash of color to brighten the winter landscape. That’s when frost-hardy annuals, bulbs, and winter-blooming or fruiting plants can be a welcome addition to the landscape. Cabbage and Kale – We are not talking about the trendy, vitamin-packed greens that you have been growing in your garden box, but a close relative. The ornamental varieties of Brassica are often much more colorful and showy, available in various shades of purples, whites, and greens. And their foliage brightens with cooler weather, so they are the perfect cure for your landscape’s seasonal melancholy. They should be planted several weeks before a hard frost and it is advisable to select larger, root-bound plants from the nursery to help avoid leggy growth. Plant in a color spot or as a nice border along your front walkway. Pansy – Pansies are an enduring fall and spring annual that can also survive the temperate winters of western Oregon and Washington. The plants can fade with especially cold temperatures midwinter, but will often bounce back. 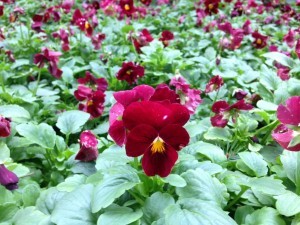 Be sure that your Pansies have good soil drainage prior to planting – you can amend existing beds with peat moss and perlite or pumice if they are heavy or compacted. You should also plan to incorporate an all-purpose granular fertilizer while you are preparing the soil before planting, then feed at 3-4 week intervals for best blooming potential. And in the event that we have long stretches of rain or cold, you may want to spend a little time pinching off the spent or leggy flower stems near the base of the leaves. Plant within your favorite containers or as a border within your perennial beds. Camellia – The flowers that you will find on Camellias are most often compared to those of shrub roses, but their bloom schedule is completely opposite of the garden favorite. Depending on the specific variety, Camellia blooms are borne against lustrous green foliage any time from late fall through early spring. They are available with single or double blooms in shades of white, pink, and red. Camellias prefer acidic soils, good drainage – do not plant in heavy, clay soils without prior amendment – and try to provide some morning sun exposure or light shade. Use this evergreen as a foundation planting near the corner your house or prune it like a small tree and place as a focal point within your perennial garden. 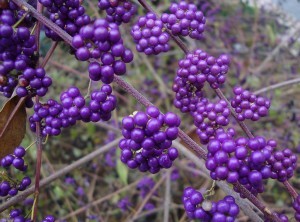 Callicarpa – Also known as a Beautyberry, this moderate-sized shrub is a show-stopper in late fall and winter with bright purple berries. The shrub offers delicate flowers during the summer which give way to long-lasting clusters of violet berries in the fall. These shrubs can tolerate a wide range of soil conditions, but they do prefer full sun. Place this shrub as a centerpiece within a perennial bed or against a contrasting background so the berries can really stand out. Photo source: https://flic.kr/p/daDf6m by Irene Grassi is licensed by CC by 2.0. Symphoricarpos – This plant is native to much of the middle to northern United States and is easy to establish. The fruit is not quite as vibrant as that of the Beautyberry, but still provides dramatic effect against a barren landscape in the late fall and early weeks of winter. The classic variety offers clusters of white berries, which supports the common name of Snowberry, but there are also varieties that bear fruit in shades of pink. The berries are considered toxic to humans, but they are a good source of food to native birds. Use this plant with other natives or within your bird-friendly habitat. Crocus – These sweet, little flowers tend to brighten any wintry landscape right as spring is approaching. They are available in an assortment of colors, most commonly white, yellow, and purple. Crocus should be planted in well-draining soils during the fall, about 2-3” beneath the soil surface. Most varieties prefer some sun, but a few will tolerate shadier spots in your garden. Plant them alongside a front walkway or in groups near decorative boulders or statuary within the garden. 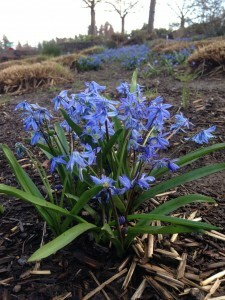 Squill – Also known as Scilla, these late winter perennials are a favorite in Northwest gardens, although the Campanulata variety can really overtake your yard if you are not careful. The Siberian Squill (shown below) is known to be a little less aggressive and more clumping, available with white and blue flowers. However, the Campanulata or Wood Hyacinth variety is ideal for naturalizing lawns and troublesome areas. The bulbs should be planted in the fall in well-draining soil with partial shade to full sun exposure. Place them amidst ornamental grasses that are cut back during the winter or to soften the sharp lines of a concrete retaining wall within your perennial garden as you wait for other plants to come out of dormancy. Need A Presentation on Fall Color? That’s really interesting that something as simple as a plant can make a huge difference. I know that my yard is pretty barren and some of those Callicarpa plants could go a long way. I’ll have to talk to a landscaper and see what they think are the best options for my yard. Thanks for the awesome info!